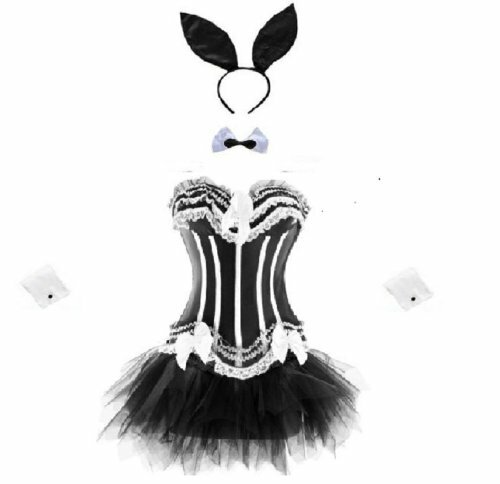 New Womens black satin corset with skirt Bunny Set, this is gorgeous and comes with matching accessories is very intricately detailed with lace trim on edges. Consists of 6 pieces the corset, skirt, bunny ears, cuffs, collar and G-string. Features side zipper closure with black lace trim design around edges top and bottom, small bows on bottom. It features lace-up back to tighten and cinch in at waist as required for an hourglass look. The matching skirt has an elastic waist and is very stretchy around waist to suit the individual. Skirt has elastic waist and is a short length.